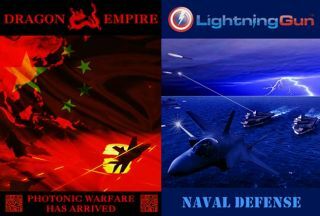 A 'Dragon Empire' book depicting a future war between China and U.S. allies aims to help fund a laser-powered EMP weapon in real life. Can a science fiction book's sales fund development of a futuristic laser weapon? A physicist hopes to find out with his "Dragon Empire" book that envisions such a weapon helping to fend off a Chinese invasion during a future war. The "Dragon Empire" book imagines how lasers, hypersonic missiles, stealth aircraft and satellite weapons might influence a huge war between China, the U.S. and U.S. allies in 2025. But the book's real purpose is to help fund Lightning Gun Inc., a startup aimed at making laser weapons capable of knocking out guided missiles with electronics-disabling electromagnetic pulses (EMPs). "I never had a good idea for an entire fiction book until I started to realize that if directed energy weapons did nullify the effect of guided missile technology, then all of warfare would be changed — especially strategy and tactics," said Adam Weigold, founder and CEO of Lightning Gun Inc.
Weigold hopes to raise $20,000 on the crowd-funding website Kickstarter to get professional editing and marketing for the book's planned release in November. The book's sales would ideally represent one way for Lightning Gun to fund large-scale laser experiments by raising $2 million over the next few years. The U.S. military has investigated the idea of laser-powered EMPs in the past. High-energy lasers can create an ionized ball of plasma by ripping electrons from molecules in the air — enough to generate a small EMP pulse that could knock out the electronic sensors and guidance systems of missiles. That means an F-35 fighter jet armed with a kilowatt-class laser could theoretically become invincible against a swarm of missiles. "Our patent-pending technology not only dramatically improves the focal accuracy of the laser plasma but helps to focus the EMP energy produced directly at the target," Weigold told TechNewsDaily. If Lightning Gun can raise about $300,000 to $500,000 to set itself up, Weigold plans to apply for U.S. Department of Defense funding through the small business innovation research program that requires companies to have established employees and security clearances. The Australian-born physicist has already moved his startup to the U.S. and unofficially recruited several physicists and engineers. Such research may come with even greater uncertainties than the average Kickstarter project — Weigold acknowledges that there is no guarantee that Lightning Gun can successfully scale its experimental results up to the kilowatt power levels needed for a viable weapon. But he hopes successful funding and testing can lead to an operational weapon within three or four years. The "Dragon Empire" story reflects a future in which China's hardliners win the battle for control over more liberal politicians, Weigold said. He envisions a full-scale war as more of a "worst-case scenario" in reality, but pointed to the possibility for smaller conflicts as the U.S. moves to enhance cooperation with its Pacific allies and China faces territorial disputes with neighbors such as Japan, South Korea, Vietnam and the Philippines. Whatever the future, Weigold sees laser-powered EMP (LEMP) and other energy weapons as game-changing military technologies. "Remote weapons" such as guided missiles and drones have become dominant offensive weapons capable of dealing out death and damage from afar, but laser weapons offer the possibility of a cost-effective defense against missiles and drones in the future. "I think as laser weapons (and LEMP) become smaller and cheaper, they have the real potential to offer defenders "remote shielding," which will be the first real challenge to the era of remote weapons," Weigold said. This story was provided by TechNewsDaily, a sister site to SPACE.com. You can follow TechNewsDaily Senior Writer Jeremy Hsu on Twitter @jeremyhsu. Follow TechNewsDaily on Twitter @TechNewsDaily. We're also on Facebook & Google+.